Over 10,000 attend Sadhguru’s Mega Program in Madurai! 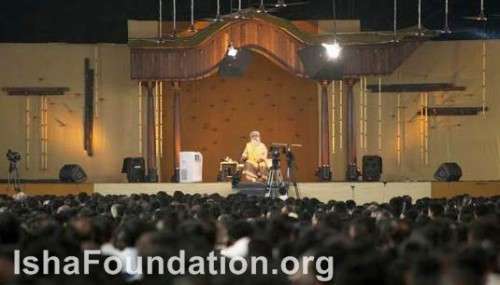 The participants sat comfortably under a massive roof-like structure, forgetting the thousands around them as they became completely engrossed in Sadhguru’s presence. The grounds had a festive atmosphere with numerous stalls displaying different facets of Isha, including the temples, Isha Ruchi and Isha publications. I never thought I would see Sadhguru initiating over 10,000 people into Shambhavi in a single evening. But Sadhguru is Sadhguru after all. I was volunteering at the program grounds during the initiation process on the last day of the class, and despite being busily involved in the hustle and bustle of organizing and all the activity that goes with it, the grace and energy that was pouring out of the dais as Sadhguru initiated those thousands of people was impossible to miss. On the first day of the program, I was wondering how the class atmosphere and ambience would be maintained in a public ground with 10,000 participants. But I needn’t have worried. His Presence took care of it. It was clear that the participants had soaked in every moment of the class. I could see by the very way they walked, talked and smiled that they had transformed over the two-and-a-half-days of the program. Looking back at it now, it occurs to me that something of such magnitude has probably never happened in the history of mankind. Just being in that space and playing a part in the small way that I could was a tremendous blessing. The Mega Programs are the latest continuation of Isha’s “Ananda Alai – A Wave of Bliss” - a spiritual movement that is spreading like wildfire throughout Tamil Nadu. Ananda Alai is part of Sadhguru’s wish that no one be left untouched by the spiritual process.